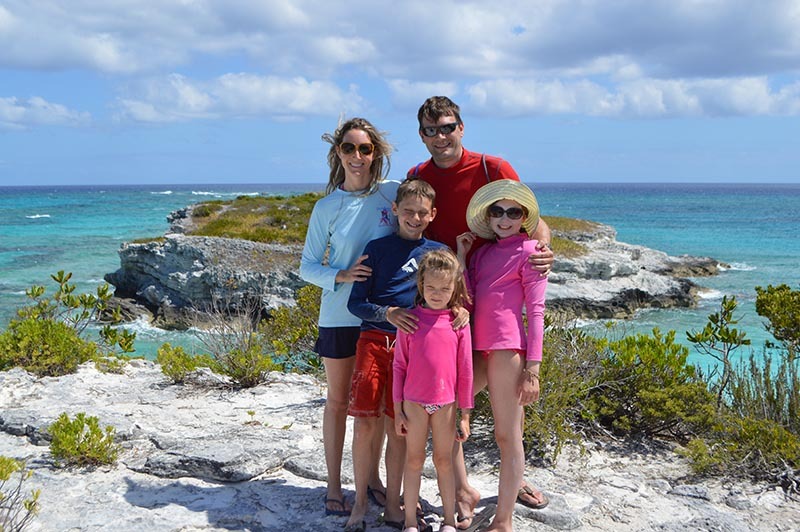 The Konesco family from Richmond, Virginia, atop a lookout at Light House Beach, Cape Eleuthera. Photo credit: Tom Dyer. Last week we had our dear pals, the Konesco family from Richmond, Virginia, down to the Cape. We met the Konesco’s two years ago at the Cape during their two year sailing adventure around the Bahamas and Caribbean. The family includes Mom and Dad, Mark and Jen, and daughters Joellen (11) and Maria (5), and son Camden (10). Cam is a fishing fanatic and we have come to love all of them. Their first full day at the Cape we took them down to Light House Beach, which is the most beautiful beach we have ever found. Yesterday (April 24) was their last day fishing with us and it turned out to be a great day. 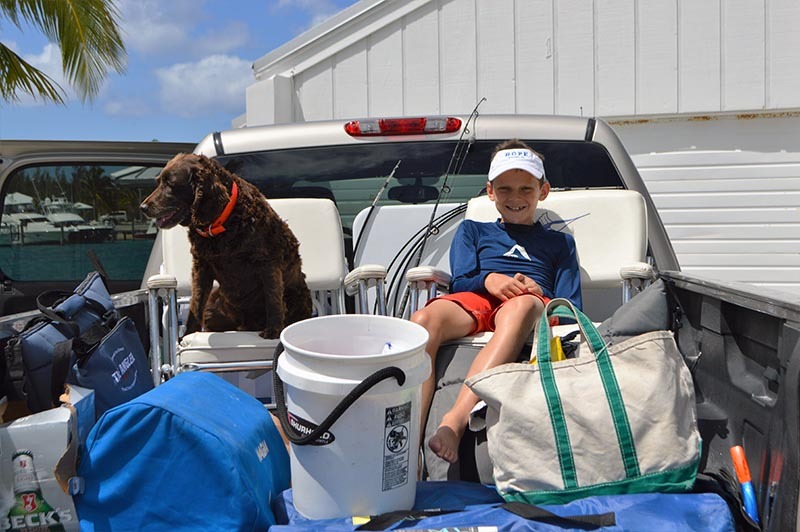 The dolphin run has finally started and we did not leave the dock until 1:00 p.m. and by 5:00 p.m. we had 14 gaffers that filled the kill box, one nice yellow fin and we got Camden his first blue marlin release. That was our third blue marlin release since we arrived. We were fishing right out in front of the Cape down around Bamboo Point and found two frigate birds and the first knock down we had four gaffers on at once, everyone had catches. The winds here have finally laid down after six weeks of 15 to 30 mile-per-hour winds. And while we could still fish out front, it was still sloppy and we could not get down to the Bridge or other favorite spots. Our Stuart Sailfish Club Flotilla arrives at the Cape on May 6th and we are looking forward to sharing our favorite fishing spot in the world with over 50 of our members and guests. More to follow. Cam is a fishing fanatic! PHOTO CREDIT: Tom Dyer. 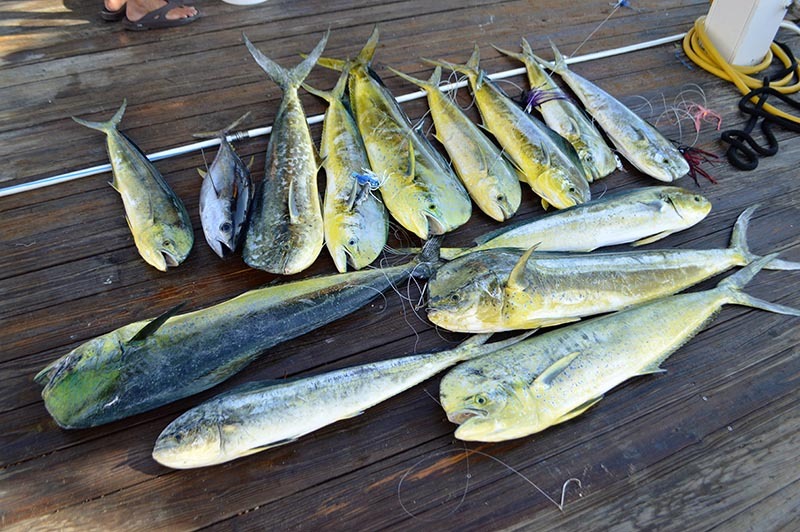 Fourteen gaffers, one nice yellow fin and a blue marlin release in just four hours! PHOTO CREDIT: Tom Dyer.